I learned a little more about cupcakes from one of our pastry cooks at work and wanted to try some 'fancier' cupcakes including fillings and using a pastry bag for icing. This recipe came from the book 300 Best Chocolate Recipes by Julie Hasson. They definitely have a kick of chili depending on what kind of pepper you choose and how much. 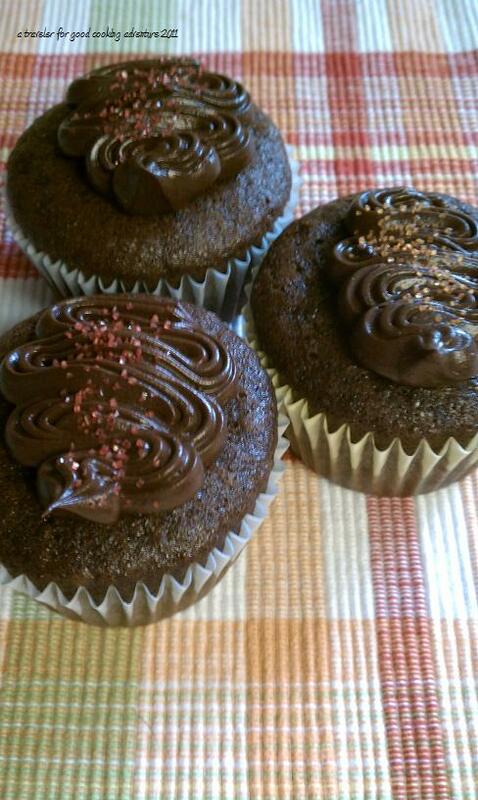 I was able to make 12 regular size cupcakes as well as another 8-10 mini cupcakes with the batter. Sift together dry ingredients in a small bowl (flour through salt). In a large bowl, whisk together sugar, oil, egg and vanilla until smooth. In a separate bowl (or liquid measuring cup) stir together buttermilk and instant coffee. Alternately whisk flour mix and buttermilk mix into the sugar mixture. Start and end with dry ingredients. Scoop batter into prepared muffing cups. 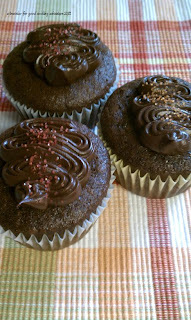 Bake for 22 to 27 minutes or until tops of cupcakes spring back when lightly touched. Let cool in pan for 10 minutes. Let cool completely before frosting. *For the mini cupcakes, the baking time was more like 7-10 minutes. Put it all in the food processor and run until smooth. I put it in a pastry bag with a tip (I couldn't tell you what the technical name of the tip, but it looked good on the cupcakes) and swirled a little on each cupcake. This is rich frosting, so a little goes a long way. I used red sugar sprinkles for the cupcakes with cherry filling and orange sugar sprinkles for the cupcakes with the mango filling.